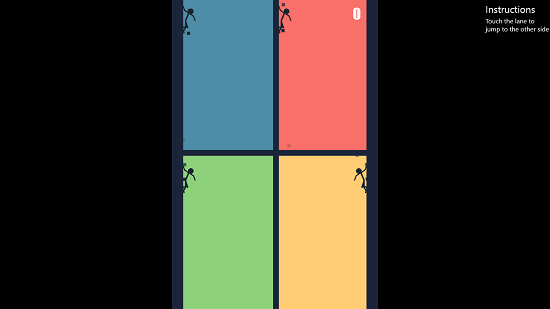 Home Apps Free Windows 8 App To Test Your Reflexes: Make Them Fall ! Free Windows 8 App To Test Your Reflexes: Make Them Fall ! Make Them Fall ! is a free app for Windows 8 and 8.1 which enables you to test your motor skills and reflexes via a game. The game has a lot of different difficulty levels which you can choose from to start playing. 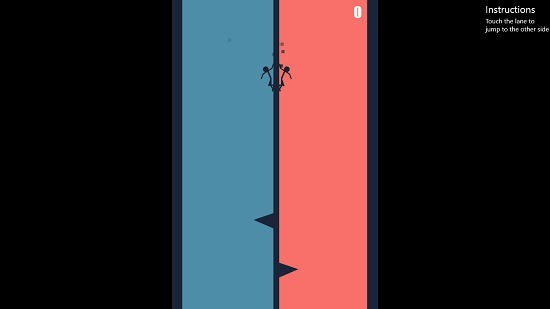 In the game, you get split screen views where you have to make the falling stick men jump from one lane to another to avoid all the obstacles in their way. As soon as any of the stick man hits the obstacle, it’s game over! The game has more and more split screen views depending on the difficulty level that you choose and select. Make Them Fall ! is available as a free download from the Windows App Store. When you launch the game, you will be presented with the main menu of the game itself. You can click on any one of the difficulty levels presented on your screen to start the gameplay for that particular level. You can also click on HOW TO PLAY? button at the bottom of the screen to get a brief idea about how you actually have to play the game itself. 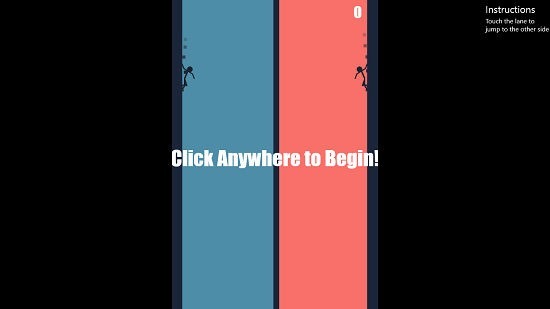 The gameplay is pretty simple, all you have to do is to click on the opposite side of the screen to that of the obstacle to make the stick man jump and avoid the obstacle. So we’ll skip the how to play section, and directly click on a level to start the game and learn more about the gameplay interface. For demonstration purposes, I chose the NORMAL difficulty level, which in itself is pretty difficult to be very frank! So all you have to do is to click anywhere on the screen to start the game. Once started, you will be able to see the two stick figures on a split screen interface, both of which you have to control. The game is best played on touch screen devices as you would have a greater control on the game, but non touch devices also work fine as you can always use mouse clicks to mimic a touch gesture on the screen. You can also see the triangular obstacles on either side of the screen which, as I already mentioned above, can be avoided by simply tapping on the opposite side of the screen as that of the obstacle. You can see the gameplay of HELL mode in the below screenshot, just to see how difficulty progresses with each level. The number of frames increase with each level, and if even one of the stick figures hits the obstacle out of the multiple split screens, it’s game over! 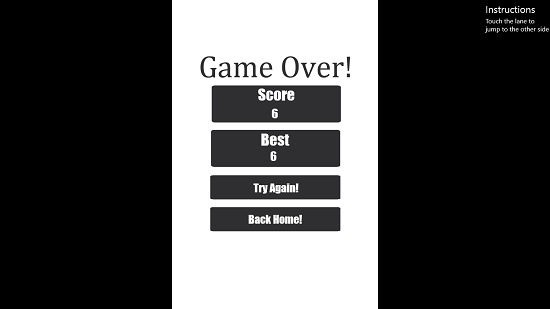 Talking about game over, when the game ends, you will be shown your score in a neat interface. To cut the long talk short, this sums up the features of Make Them Fall ! game for Windows 8 and 8.1. Make Them Fall ! is a well designed game app for Windows 8 and 8.1 which allows you to test your motor skills and your reflexes by checking how you perform in the game. The game is available for free from the Windows App Store, and being ad free as well, this makes for a great way to while away your time on your device. 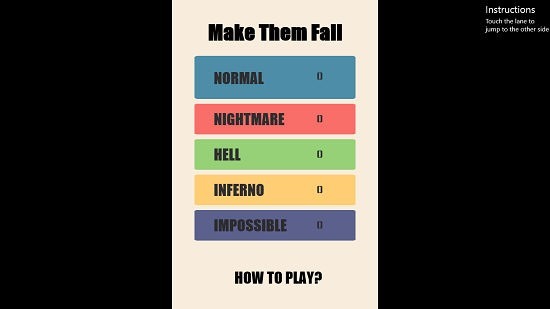 Get Make Them Fall !